A historic house devoted to the teachings of a 1700's prophetess and her mysterious box of revelations. 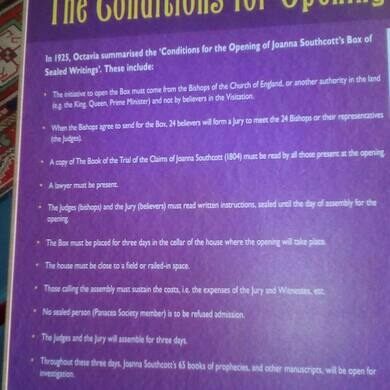 Preserving the teachings of the religious prophetess Joanna Southcott, the Panacea Museum also campaigns to finally open Southcott’s sealed box of revelations which has supposedly remained closed for over 200 years. Joanna Southcott, born 1750, began having religious visions around the age of 42, believing that she had supernatural contact with God and was the woman spoken of in the Book of Revelation. Southcott often talked of the coming of new messiah and messenger from God, and in her 60’s, she even claimed that she was pregnant with the holy child. His name was to be Shiloh. Unfortunately the pregnancy was a hoax (or as Southcott claimed, the child was immediately called to heaven upon its birth), and the religious maverick died not long after. By the time of her death it is said that she had near to 100,000 followers, however it was not her following that would be her lasting legacy, but the sealed box of visions she left behind. Before she died, Southcott collected what is believed to have been a number of her visions that would help save her followers. She sealed these things in a box that was not to be opened until a time of “national crisis.” The contents of the box were to shown only to the 24 (in Southcott’s time) bishops of the Church of England, who were then to study the findings for a full seven days. No one knows what is truly in the box, or for that matter if it is even still around. In 1927, a publicist and psychic researcher named Harry Price claimed to have acquired the box and made a very public display of opening it. The contents of the Price box included such odds and ends as scraps of writing, a pistol, and a lottery ticket. However, devoted Southcottians such as the Panacea Society believe that Price’s box was a hoax and that they and they alone known where the true box lies. The Panacea Society in particular has been extremely vocal about trying to call the bishops together to open the box, going so far as to hire billboards in the 1970’s that carried the slogan, “War, disease, crime and banditry, distress of nations and perplexity will increase until the Bishops open Joanna Southcott’s box.” The Catholic church has refused to give any credence to the importance of Southcott’s Box. Today, the Panacea Society is known as the Panacea Charitable Trust and runs the Panacea Museum out of the house that was appointed to garrison the 24 bishops when they came to open the box. Each lush Victorian room walks visitors through the history and beliefs of the society, even displaying a replica of the Southcott box. The messiah has not yet returned for these religious devotees, but they may be more prepared than anyone when he does. A rare example of the RAF’s flying spy taxi. The peace pagoda to be constructed in the Western world sits next to a small English lake. This suburban British town holds secrets that would have made the druids proud.